A forensic analysis of the 2018 SUNS Club Champion round-by-round votes shows that after a fluctuating first 10 games, Jarrod Harbrow led the count from Round 12. And he was as many as 77 votes clear at Round 17. He was voted the SUNS best player four times by coach Stuart Dew and his off-siders, and nine times ranked in the best three. Eleven times – half the games – he was in the best five. As the season unfolded, in 22 games, no less than 16 different players topped the vote count (including ties) - Harbrow (4), Thompson (2), Sexton (2), Swallow (2), Young (2), Holman (2), Steven May (2), Miller (1), Weller (1), Witts (1), Martin (1), Tom Lynch (1), Jack Bowes (1), Brayden Fiorini (1) and Michael Barlow (1). Five different players led the count through the first 10 games. It was Young at Round 1, Lynch at Round 2, Harbrow at Round 3, Swallow at Round 4, Harbrow at Round 5, Swallow at Rounds 6-7 and Miller at Round 9-11, remembering Round 10 was a bye. There was nothing in it early as the SUNS endured an extraordinary travel schedule that saw them play twice in Perth and Brisbane in the first nine games, and once each in Cairns Melbourne, Adelaide, Ballarat and China. Swallow’s 11-vote lead at Round 4 and Round 6 the biggest. Miller and Swallow filled second spot in the count through to Round 17 before Thompson mounted a charge. He polled strongly during Rounds 15-18 in a run that ended when he held Sydney’s Buddy Franklin goalless. The homegrown fullback, back to the sort of form that saw him finish 4th in 2013, was 44 votes behind Harbrow but he was mounting a challenge. Sadly, an injury the following week ended his season, but still in 17 games he topped the vote count twice, was top three six times and top four eight times. Thompson’s burst of four consecutive games of 20+ votes was the second best of the season. Only Swallow’s blitz in the first six rounds was better. Harbrow, Miller, Sexton, Young, Martin and Lyons also had three 20+ games in a row – all in Rounds 1-2-3. Miller, whose B&F form line in his first three seasons at the club read 4-7-8, got to third in Round 5 and was never outside the top three thereafter. Voted top three six times and top five eight times, he jumped to second in Round 22 after Thompson’s injury. Weller, the Gold Coast SUNS Academy star traded home from Fremantle over the summer, floated around the middle part of the top 10 through most of the season, and jumped to third at Round 18. There he finished after being voted top three six times. Swallow, with a proud record of five top 10 finishes in the first seven years despite his injury woes, including a win in 2015, was similarly consistent. He was a fixture in the top four through to Round 17 but when he was rested in Rounds 18 and missed Round 20 through injury he dropped out of contention. He ranked in the top three in the game-by-game vote five times. Sexton, the SUNS’ leading goal-kicker this season and judged the club’s most improved player after finishing 8th in the B&F in 2016, was the big mover late. At Round 17 he was 11th, no less than 165 votes back, but polled heavily in the last six rounds to make up votes on the leaders and finish fifth. He figured top three in the votes four times and top five eight times , including five times in the last six games. Off-season rookie draft pick-up Nick Holman was a big success story. He featured prominently in the votes early, with 27 possessions and 25 tackles in the first two games and only twice dropped out of the top 10 before finishing 8th. Young added a 6th place finish at the SUNS to his 8th placing at Port Adelaide in 2016, while Martin’s 10th place finish was added to consecutive 3rd places, while Witts broke into the top 10 for the first time. He was 9th. There were 12 occasions when a player polled 40 votes or more. 50 – Tom Lynch – Kicked a career-best eight goals against Carlton at Etihad Stadium in Round 2. 48 – Touk Miller – Won the Ashcroft Medal in QClash15 in Round 5 at the Gabba after a brilliant shut-down job on Brisbane’s Dayne Zorko. 46 – Rory Thompson – Held Buddy Franklin goalless in the unforgettable Round 18 at the SCG, when the SUNS held the Swans goalless for an hour to come from 29 points down to win by 24. 45 – Aaron Young – Kicked a season-high and equal career-best four goals in the same SCG win over the Swans. 44 – Jarryd Lyons – Had a season-high 36 possessions, including 26 contested possessions – one short of Gary Ablett’s club record – in Round 2 against Carlton. 44 – David Swallow – Had 32 possessions and kicked three goals against Adelaide at Adelaide Oval in Round 6. 41 – Aaron Young – Made a brilliant start to his SUNS career when he had a career-best 27 possessions kicked one goal and made nine tackles in the cyclonic Round 1 clash with North Melbourne in Cairns. 40 – Jarrod Harbrow – Played his eighth game at ‘home’ in Cairns and used his smarts to great effect with 23 possessions – all kicks – playing behind the ball in the wet. 40 – Jack Bowes – Like Harbrow, it was a case of local boy made good. Playing his second game at home, he had 21 disposals and a goal to celebrate his first win in in front of friends and family against North in the season-opener. 40 – Jarrod Harbrow – Playing his 14th QClash against Brisbane at the Gabba, he celebrated his sixth win after 21 disposals. 40 – Lachie Weller – Kicked two brilliant running goals and had 23 possessions in the Round 18 SCG win over Sydney. 40 – Alex Sexton – After a career-best five goals in Round 20 against Melbourne, he followed up with four goals in Round 22 in the return QClash at Metricon. Interestingly, who do you think may have topped the count on a votes-per-game basis? Darcy Macpherson started the season with 31 and 36 votes in Rounds 1-2 but didn’t play at AFL level after Round 5. Still, his 97 votes at 19.4 votes per game saw him top this category from Thompson (18.6), Harbrow (17.7), Fiorini (16.8), Martin (16.6), Miller (16.0), Lynch and Weller (15.3) and Swallow (15.0). Macpherson was the only player to poll in every game he played. Harbrow polled most often overall – 19 times – followed by Miller (17), Weller, Sexton and Witts (16), Lyons (15), Thompson, Young and Holman (14), Swallow, Martin and May (13). Aside from Macpherson, Martin boasted the highest percentage vote ratio at 86.7% (13 of 15), followed by Harbrow (86.4%), Thompson (82.4%), Lyon (78.9%), Miller (77.3%) and May (76.5%). Weller, Sexton, Witts and Fiorini were all 72.7%. 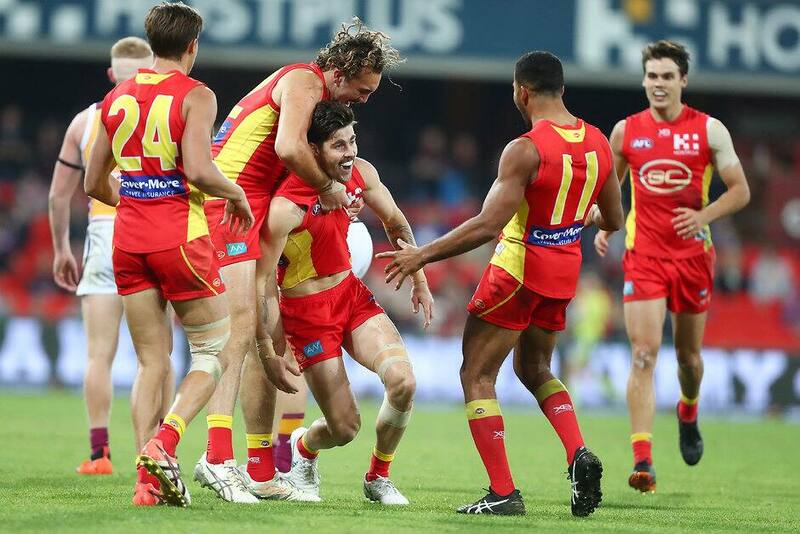 There were six changes to the top 10 from 2017 to 2018 – Weller, Thompson, Sexton, Young, Holman and Witts replaced Lynch, Lyons, May, Gary Ablett, Aaron Hall and Adam Saad.